Clemson, SC – The University of Virginia football team has made a $2,565 contribution to the Fahmarr McElrathbey Fund. Coach Al Groh contacted Clemson Head Coach Tommy Bowden Wednesday morning to make him aware of the contribution. 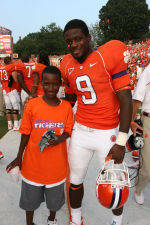 Ray Ray McElrathbey is a freshman defensive back on the Clemson football team, who was granted custody of his 12-year-old brother Fahmarr in August. McElrathbey’s parents are unable to care for the young man. The brothers live together in an off-campus apartment in Clemson. Earlier this year the NCAA granted Clemson a waiver, allowing a local bank (First Citizens Bank of Clemson) to establish a fund for Fahmarr to care for his basic daily needs. The waiver also allows the wives of Clemson assistant coaches to provide Fahmarr transportation to and from school. Virginia team captains Chris Long, Christian Olsen, Deyon Williams, and Marcus Hamilton collected the money on Monday from their teammates. “In just like an hour, I think we collected just over $2,000,” said junior defensive end Chris Long. Virginia players contributed some of the meal money they receive while in town over the Thanksgiving holiday. “It’s a really legit cause, and I think it’s great. Everybody really bought into that,” Long said. This is the second time a Division I team has contributed money to the fund. Earlier in the year the Temple football team contributed their per diem ($1500) the day of its game against the Tigers in Charlotte. Temple is coached by former Virginia assistant Al Golden. “Wow, this is wonderful,” said Ray Ray McElrathbey on Wednesday when he was made aware of the contribution. “I am very appreciative of the support from the football players at Virginia and Temple. It really makes me feel good about being a part of college football. I can’t thank them enough.